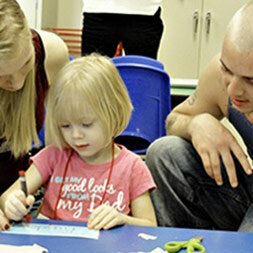 Parent and family engagement in Head Start is about building relationships with families that support family well-being, strong relationships between parents and their children, and ongoing learning and development for both parents and children. Evidence suggests that when there is a strong partnership between families and the teacher, the children form better relationships in life, feel good about themselves, and even do better in school. It is only natural that all of those who enter the lives of young children work together with other adults and parents to give a child safe, healthy, and meaningful early experiences. Each year Head Start welcomes parents, staff, community volunteers, and MVAC Board Members to help us evaluate our program. All families are given an opportunity to evaluate the program by completing a Parent Program Planning Evaluation twice a year. Your input helps us to plan for future programming. Strong Fathers-Strong Families gives the child’s father or a male figure the opportunity to participate in the child’s Head Start experience by coming into the classroom, attending a science night, math night and a reading night. Events held in October, December, February, and April. Take home activities in September, November, January, March, and May. LILACs is a group for mothers or female figure to meet and help with classroom projects and learn new skills. Family Activity Days happen in October and May. This is an opportunity for the whole family to join in the Head Start fun.